After having reviewed the micro tip Pilot Hi-Tec-C 0.3mm gel ink pens and the 0.4mm, of course I must now do the 0.5mm! The 0.5mm is a comfortable size for most people. It's not so little that it has that slightly scratchy feel (common with the 0.3mm), nor does it give the impression that the tip might bend with a heavy hand. Though all my 0.3s have been solid, it did cross my mind that if I was too heavy-handed, I could wreck the tip. I never have though! But the 0.5mm is certainly more solid. The bodies of all the Hi-Tec-Cs are the same - pretty unspectacular but they do the job. You can always buy prettier bodies for them and just use refills if you'd like. I kind of enjoy seeing the rainbow of colors through the clear plastic barrels though. I can't get as precise and crisp lines as with the smaller tips, but it's still great. They never blob ink, and the ink dries very quickly so it's never smeared. It also doesn't bleed through pages - even thin paper like that of Filofax (curse you Filofax!). It's not archival quality ink though, which is a bummer. That's the only thing these pens are missing. I have been lucky to have no issues with hard starting or dried out Hi-Tec-Cs. Especially with the 0.5s though, they always flow well. They are getting a little pricy, but they're worth a shot. I think they last a pretty long time, despite being gel ink, which usually runs out fairly quickly. It must be the wee little tips! Yes, yes, yes. If you haven't tried Hi-Tec-Cs yet, you owe it to yourself to give them a shot. Get one of each tip size even. Or one of each tip size AND color. Boy, that would be fun! 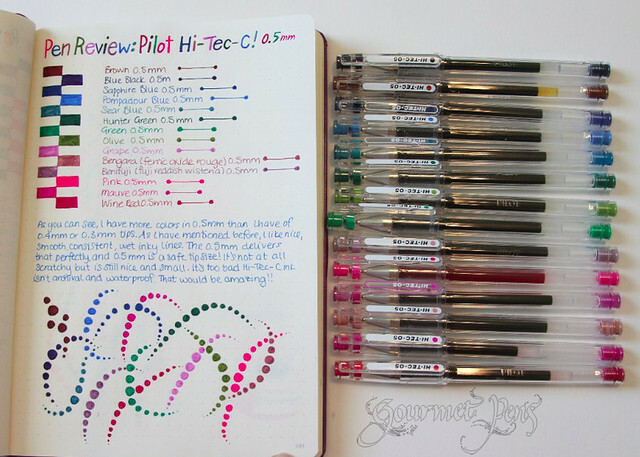 I love the Hi-Tec-C pens! Hi-Tec-C's have a bedazzling range of fantastic colours including a set of five (?) special Japanese ones like Bengara. Yep yep, I have two of them - very lovely. This is a pen that I hear a lot about, but still haven't had the chance to try. I need to get on this stat! Really like your doodle in the last photo, too. Hi-Tec-C's are fantastic. If one wants variety, get the Maica's (just got an order of them from Jet Pens...again, awesome), or get the multi-pen Coleto Hi-Tec-C (I have three so I have nine colors in three pens in immediate proximity instead of "lugging" nine to meetings. Azizah - this may seem a silly question, but when doing your lovely circle-patterns [like squid tentacles but prettier], do you start in the middle with the biggest circle and work outwards, or do you start with a teeny one and get bigger? Or do you quite literally go with the tentacle-flow? Know that across the Pond, in London, someone is now copying your dot tentacles and LOVING the discovery of a new doodle. I am very grateful! Lovely pens if you don't mind a wee bit of feedback. The 0.5mm are your best bet if you want to avoid it. The colour range... OH MAN. Thank you Bob! 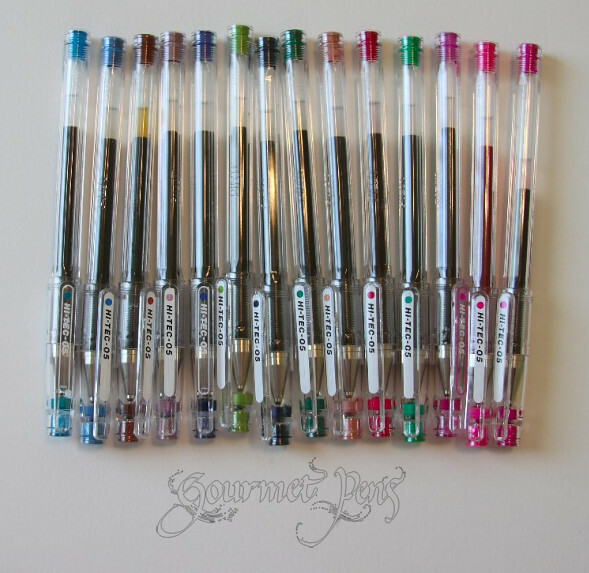 Have you tried the Uni-ball Signos in 0.28 or 0.38? They might be a touch less scratchy. I must get a Maica or two - they look pretty! I have two Coletos as well hehe but I wish they had MORE colour refill options!